If you only plan on visiting New York City once in your life, then a visit to Rockefeller Center and midtown Manhattan should be on your list. After you visit Rock Center, there are a number of nearby attractions to check out. If you start to get peckish, there are an abundance of eateries within blocks in every direction. Before you head out adventuring past Rock Center, make sure you take a trip to the observation deck at the top of the Rockefeller Center. This bird's eye view gives you perspective as to where to stop next on your own walking tour of midtown Manhattan. Built between 1858 and 1879, St. Patrick's Cathedral is a popular New York landmark and is one of the most famous cathedrals in the world. Located in midtown right across from the Rockefeller Center, this church is considered the predominant symbol of Roman Catholicism in New York, housing the archbishop's throne. The MoMa is an art museum on 53rd Street with some of the world's best modern and contemporary art. Visitors can enjoy popular works like Vincent van Gogh's "The Starry Night" to experimental art by emerging artists at PS1. Adjacent to the New York Public Library, the Bryant Park town square is a place for free entertainment events, visual and cultural outdoor experiences, and colorful gardens for visitors. Just Salad: Located at 30 Rockefeller Center, vegetarian-friendly Just Salad is a specialty salad cafe that offers wraps, bowls, and other fresh food. This is a great option for those with food allergies, a craving for a sandwich, or those looking to eat on a budget. Harry's Italian Pizza Bar: One of the quintessential foods of New York is pizza. And, Harry's Italian Pizza Bar, located in the concourse of 30 Rockefeller Plaza, offers cheap slices and pies that are both generous in quality and quantity. Visitors looking for delicious ingredients from the crust to the sauce will want to stop by. NYY Steak: American steak enthusiasts might want to consider NYY Steak, so named for the New York Yankees, as a fine-dining steakhouse option. Located at 7 W 51st St, between 5th and 6th Ave, families and couples can enjoy an array of steak, duck fat potatoes, scallops, pasta, ribs, cheesecake, and gluten-free menu items. This can be a great place to sit down to relax after a long day sightseeing or to celebrate a special occasion. Summer Garden & Bar: During the warm weather months, the Summer Garden & Bar is a reasonably priced, classy American restaurant located at 20 West 50th Street, on the spot where the Rockefeller Center ice skating rink normally sits during the winter months. The restaurant offers a variety of lunch and dinner options like shrimp, burgers, and salads to enjoy with a beautiful view. In the winter, this popular eatery is closed to make way for the ice rink. Bryant Park: Bryant Park is a short walk from Rockefeller Center. 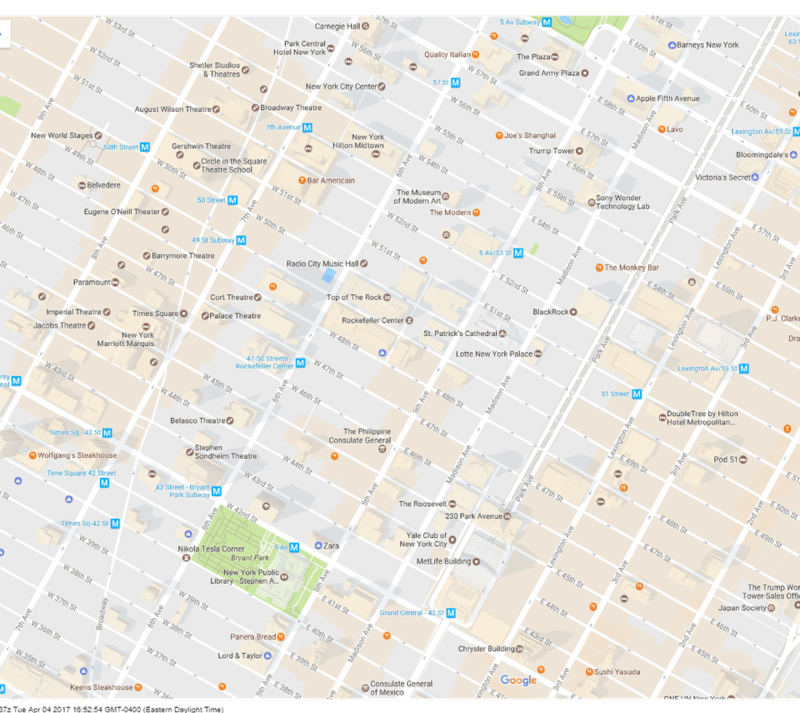 Located between 40th and 42nd streets between Fifth and Sixth avenues, check out sit-down restaurants such as the Bryant Park Grill and the casual cafe at the Southwest Porch. Rockefeller Center is a national historic landmark located in the center of midtown Manhattan. The complex includes 19 high-rise buildings located between 48th and 51st street from Fifth to Sixth avenues. Some of the more common buildings at Rockefeller Center include the 30 Rock building (formally known as 30 Rockefeller Plaza), Radio City Musical Hall, and the underground pedestrian concourse of shops and restaurants. Rockefeller Center is also home to some famous family favorites around the holiday season, like the Rockefeller Center Christmas Tree, where they have the annual tree lighting tradition, as well as the popular Rockefeller Center Ice Rink. Raymond Hood was the architect who designed the Rockefeller Center with John D. Rockefeller, Jr. as a hub of art, style, and entertainment. John D. Rockefeller, Jr. was an American philanthropist who provided more than $537 million to various projects related to education, culture, medicine, and more. Rockefeller's vision was to build a "city within a city," which was started in 1933. The center was created during some of the hardest times during the Great Depression and was able to provide jobs to more than 40,000 people at the time. By 1939, the complex brought over 125,000 visitors daily. Today, more than a million people visit Rockefeller Center annually.